These little sandwiches are pretty dang tasty. Umami overload. My favorite. Next time I will add roast beef or pastrami. A delicious meal with very little effort. Preheat oven to 400°F. On a baking sheet, toss sliced mushrooms and onion in olive oil, salt and pepper. Roast the veggies for 20 to 25 minutes, until lightly browning around the edges. In a non-stick skillet, melt the butter. Take the four slices and dip them in the melted butter. Be sure that the butter is evenly coating the four sides. Remove the skillet from the heat. 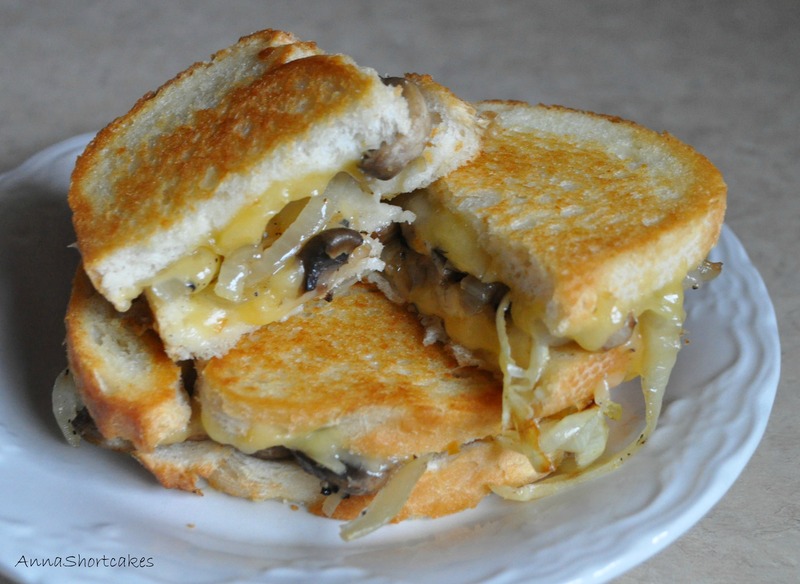 Assemble the sandwiches in skillet in this order- bread (butter side down), 1/4 of the cheese, roasted onions and mushrooms, 1/4 of the cheese, bread (butter side up). Lightly press together to help things settle. Grill over medium heat until each side is lightly browned and the cheese is melty. Inspired by this recipe. I rarely buy a cookbook. Very few of them have more than 5 recipes that seem unique or appeal to my taste buds. The Smitten Kitchen Cookbook by Deb Perelman is a cookbook I will buy. 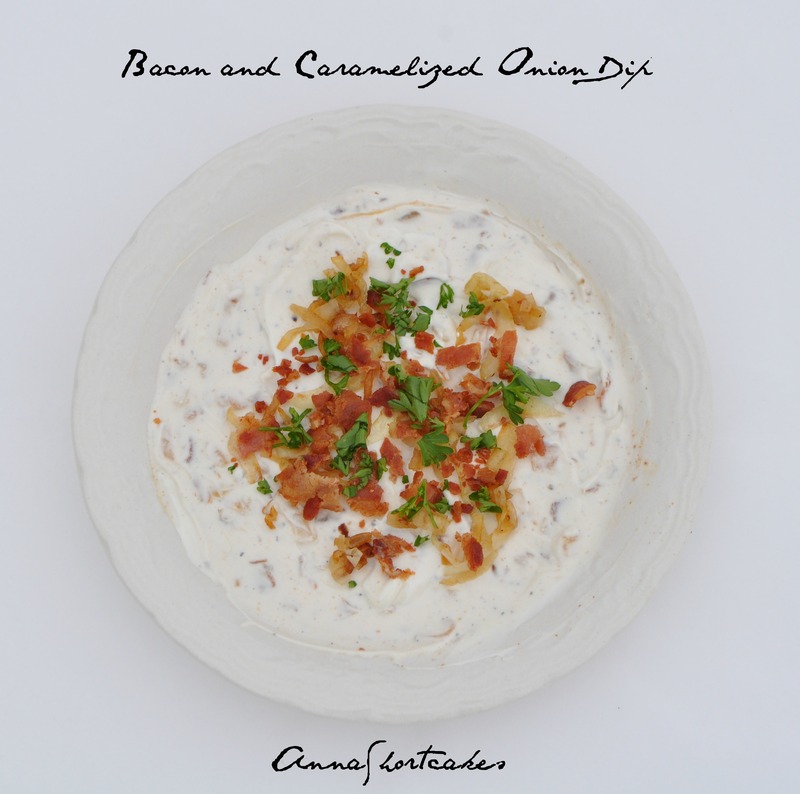 It has fantastic pictures, deliciously appealing recipes, and she writes in such a delightful style. She makes you wish you were her neighbor or your kids went to the same school so you would have a reason to pop into her kitchen and try her treats in person. But since I don’t know her, I will just have to be content with making her recipes. So far I have made 5; each has been delicious. And there are so many more I want to try. Cook the rice according the package directions. Preheat oven to 375 degrees. Heat the butter and olive oil in a heavy bottomed skillet (no non-stick) over medium heat. 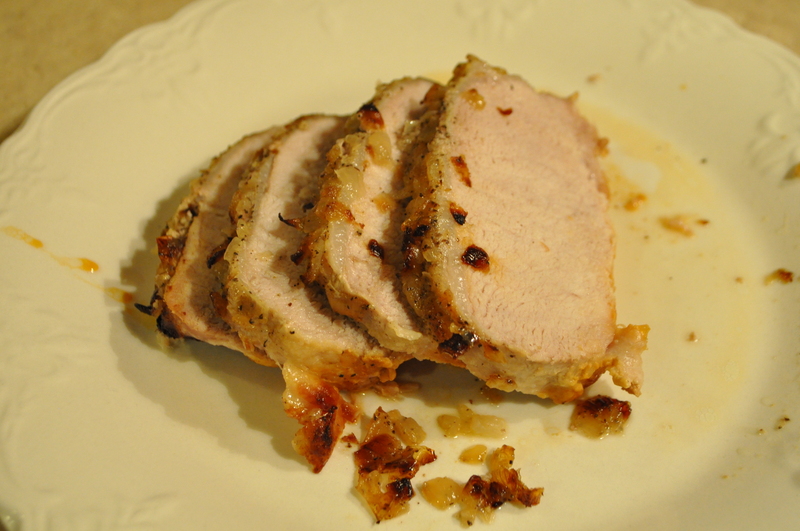 Add onions, sprinkle with salt and pepper, and cook until tender and sweet (about 30 minutes). Stir occasionally. Add the kale ribbons and cook until wilted (about 5 minutes). 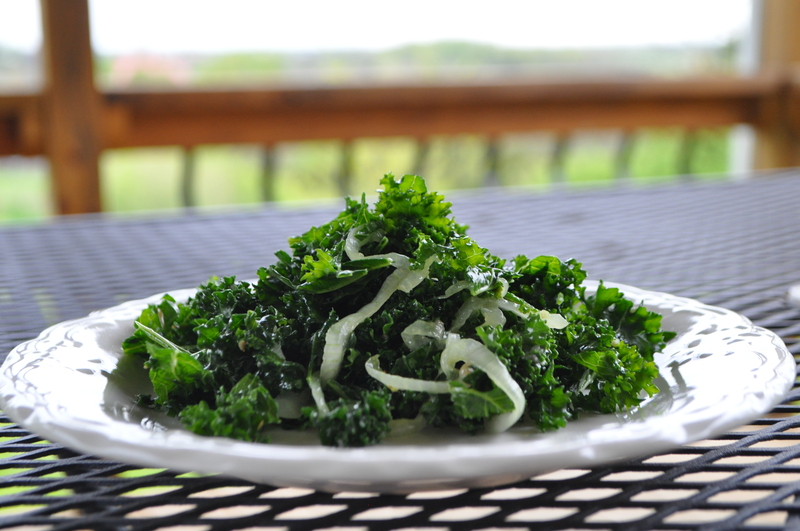 Stir together the onion-kale mixture, wild rice, and 1 cup of the grated cheese in a large bowl. Season with salt and pepper as needed. Grease a 2 quart baking dish with 1 tbsp of the butter. Spread the wild rice mixture in to the prepared pan. Pour broth over it. Sprinkle the remaining cheese over the rice. Toss the breadcrumbs with 1 tbsp melted butter, salt and pepper to taste. Sprinkle over cheese. Bake for 30 to 35 minutes, or until bubbly and beginning to brown on top. Serves 10 to 12 as a side dish. Refrigerates and reheats well! Nearly three years ago my family spent Easter in Oak Ridge TN. Sadly it wasn’t the happy family gathering one would expect. We had gathered at my grandparent’s home to surround my grandfather with love as he slowly died of lung cancer. We were emotionally drained and meal planning was not even a thought, much less a priority. A lovely neighbor, Caramia, prepared us a delicious meal. One of the dishes she brought was this salad. It was so fresh and the bright flavors helped us break through our fog of grief for a brief moment. We actually managed to enjoy the meal, despite the sadness in the air. Perhaps it was because her kindness reminded us that there was goodness in the world just outside our walls. Every time I fix this salad I am reminded of Caramia and the importance of giving to others while they grieve. I am reminded of how much I miss my grandfather and I rejoice that I was blessed to have him in my life. Preheat oven to 400 degrees F. Arrange the asparagus and peppers in a single layer on the baking sheet and gently coat with a bit of olive oil. Roast 8 to 10 minutes or until tender, turning half way through to prevent burning. Remove from heat and cool completely. 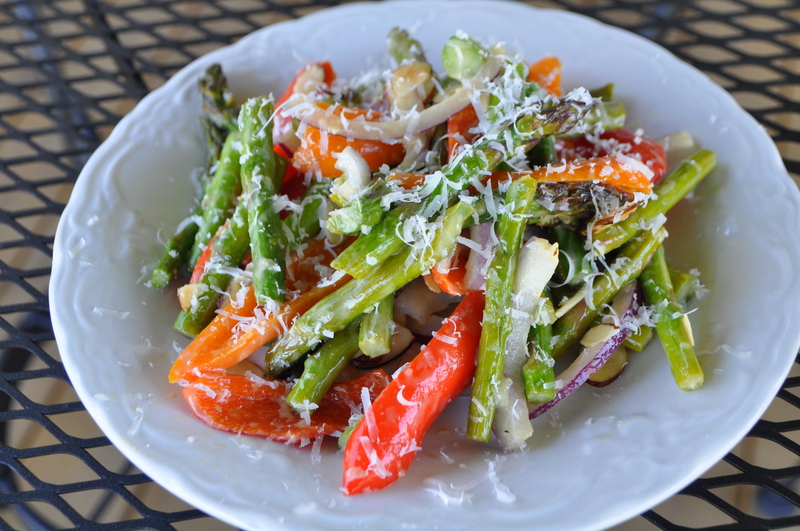 In a bowl, toss together the asparagus, bell peppers, onion, almond slices, and Parmesan cheese (if you are making this in advance, don’t add the Parm until you are about to serve it). 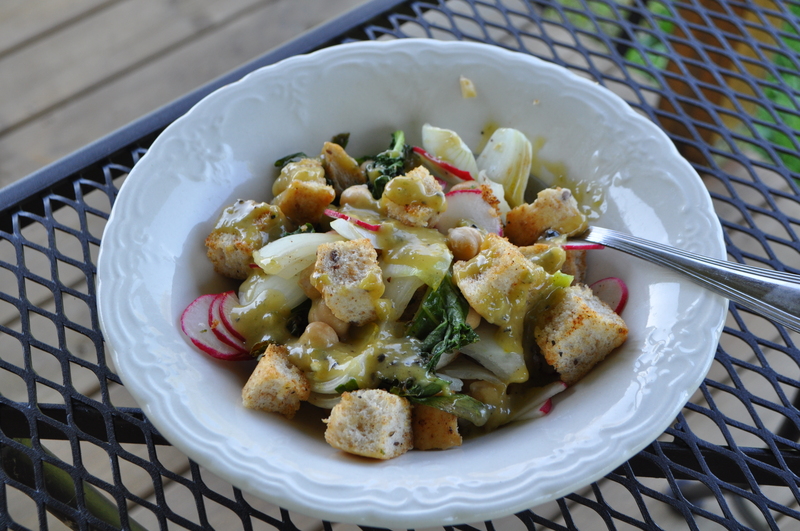 In a separate bowl, mix the 1/3 cup olive oil, Dijon mustard, garlic, lime juice, sugar, and hot sauce. Pour over the salad, and toss to coat. Refrigerate then serve. 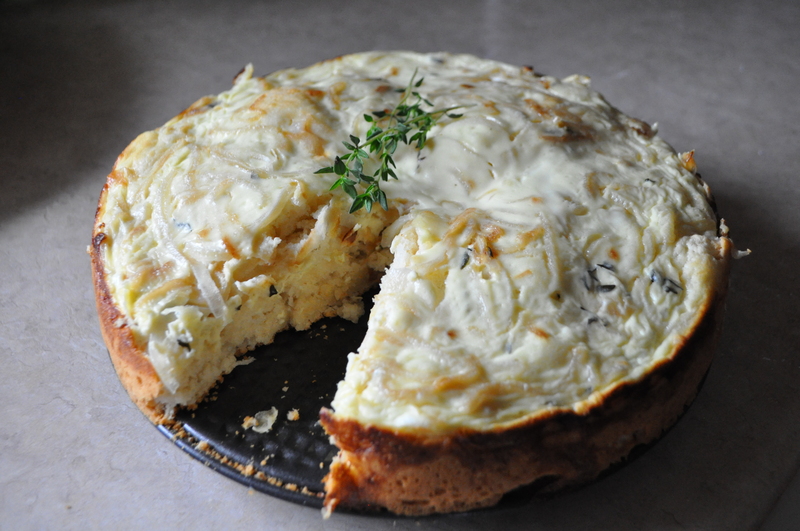 The best part about this tart is the browned, crunchy crust of cheese and onion. It is so flavorful! I love this new dish and can’t wait to make it again. 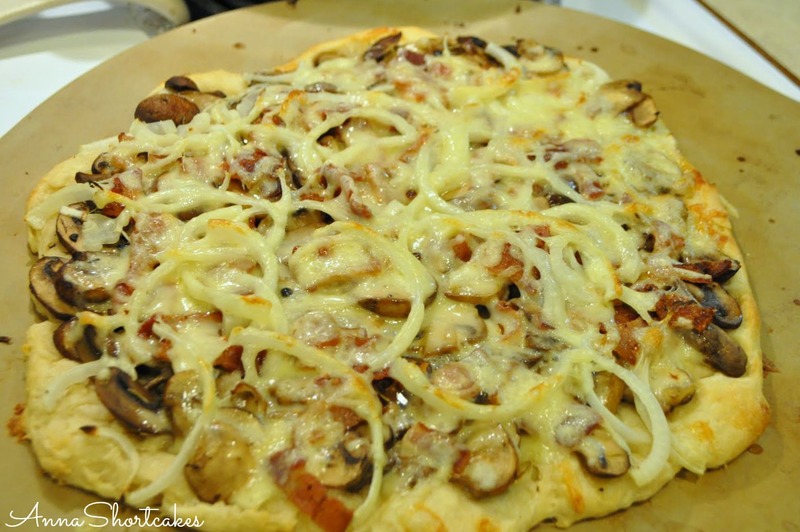 I think that you could use a ton of different cheese combinations to increase your flavor power. 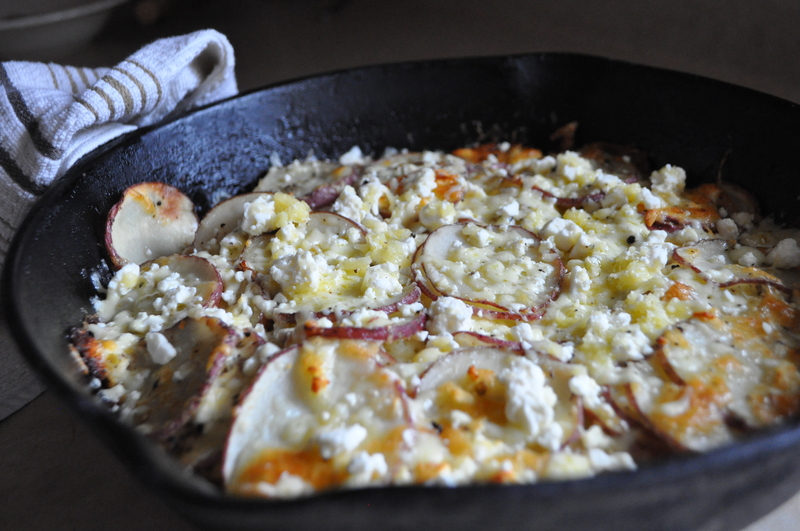 Or make it a complete dish by adding leftover roast and blue cheese. MMMM!! Preheat oven to 400 degrees. In a cast iron skillet, melt the butter and saute the thyme and onion for 5 minutes. In a bowl, toss the potatoes, cheeses, salt and pepper. Spread evenly over the onions. Bake for 30 minutes or until cooked through and fork tender.